Nioghalvfjerdsfjorden Glacier (79North) is an outlet glacier in Northeast Greenland, which drains approximately 8.4% of the total Greenland Ice Sheet (GrIS) area (Mayer et al., 2000). The glacier terminates in a large floating tongue that is currently pinned on submarine islands approximately 70km in front of the grounding line. Up-glacier from the grounding line is a bedrock over-deepening that is below sea level and extends far into the interior of the ice sheet. Due to this overdeepending, 79North is potentially unstable, especially if there are changes to its current terminus configuration, which could be triggered by warming climate or basal heat flux (Reeh et al., 2001 and Thomsen et al., 1997). A change in the force budget of 79North Glacier could contribute significantly to the mass balance of GrIS in the future. In this study, remotely sensed data sets of surface velocity, bed topography, elevation, accumulation rates, and terminus position over time were used to calculate the mass budget and force balance of 79North Glacier. Preliminary results indicate that 79North currently has a slightly negative mass budget, which is supported by IceSAT measurements that show minor regional thinning (Csatho, pers. comm.). Sea level rise from enhanced ice sheet discharge is one of the largest and most immediate consequences of climate warming. Roughly half the increase in Greenland mass loss comes from the acceleration of outlet glacier flow (Van den Broeke, 2009). Here, we seek to understand mass changes and flow variability of Upernavik Ice Stream. Upernavik Ice Stream, located on the Northwest coast of Greenland, consists of four glaciers which all drain into Upernavik Icefjord. Upernavik Ice Stream is a unique system to study, because its four tongues are experiencing different patterns of ice dynamics and mass loss over time. We will investigate mass changes of each tongue and the flow pattern of Upernavik North using remote sensing data sets for accumulation rate, ice velocity, surface elevation, ice thickness, and bed topography. 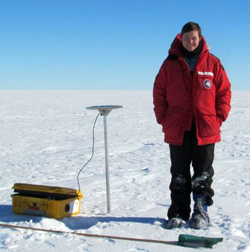 The presence of meltwater at the base of an ice sheet can reduce basal friction and cause an increase in ice velocity, and is therefore critical for understanding ice sheet dynamics. While the production of meltwater due to pressure-melting can be modeled using direct measurements of ice thickness, surface slope, accumulation and surface temperature, the contribution of geothermal heat to basal melting is largely unconstrained. Models of the Greenland Ice Sheet (GrIS) approximate geothermal heat flux as uniform at all locations in Greenland, but this is unlikely given probable volcanics (Fahnestock et al. 2001) and the variety of lithologies observed in ice-free regions. This study undertakes a comparison of the meltwater distribution beneath the GrIS as computed by simple force-balance methods with observed meltwater locations. A technique for the detection of meltwater by radar measurements has only recently been developed (Siegert et al. 2000) and applied to flightlines over the GrIS (Oswald et al. 2008). Direct measurements of subglacial melt and basal temperatures are available at the location of several ice cores in Greenland. This study aims to constrain previous geothermal heat flux maps for Greenland by incorporating measurements of observed melt (from ice cores and airborne radar observations) into a numerical model. Considerations of the relation between meltwater production and meltwater storage given meltwater evacuation and basal freeze-on are relevant for future research on the basal conditions of ice sheets. CReSIS (Center for Remote Sensing of Ice Sheets) designs several radars for use in remote sensing the cryosphere. This work involves modifying the frequency modulated continuous wave (FMCW) radars. Our radars are designed to operate at altitudes centered on 1500 feet. We are testing to see if we can calibrate them to improve the side lobe and dynamic range performance in a way that it will allow operation up to 65,000 feet. With FMCW radars, distortion in the signal after transmission is expected. However, the distortion in the signal can be measured and is predictable. Predistortion of the signal before transmission should be opposite to the distortion of the system so that the two cancel each other out when the signal is returned, ending with a clear, easy to transcribe signal. We will be calculating the distortion received from the signal at 65,000 feet and testing whether predistortion of the transmit signal and reramping the receive signal to clean the signal is possible or not. Current studies have noted that there is a major increase in glaciers growing smaller over the past few decades. The cause of this is glacial retreat which happens when the exceeding of ablation over accumulation occurs. Ablation is the removal of snow and ice by either melting or evaporation from glaciers. Glacial retreat can eventually lead to rising sea levels. This study will focus on how the Jakobshavn Glacier has change over the years and include a development of a high school education module. Using imagery collected from Landsat 1-7, students will utilize GIS software to visualize and analyze these changes over time in relation to future sea level rise. Temperature varies from location to location due to many factors, such as geographical differences, internal heat, and climate. Introducing this topic in secondary education can be a bit challenging; consequently this research is two-fold. Using a non-contact infrared thermometer, RYOBI, research was conducted to observe two t-shirts (black and white) absorbing and reflecting heat. Findings determined that these t-shirts reflected and absorbed heat differently. A hypothesis test performed at the 95% confidence interval rejected the null hypothesis that the average temperature on a sunny day of a black t-shirt was lower than the average temperature of the white t-shirt in the same condition. Data was gathered and constructed for secondary education purposes in the field of science, with some mathematics background in hopes of proving that math can provide further explanations in the assumption that black is hotter than white. 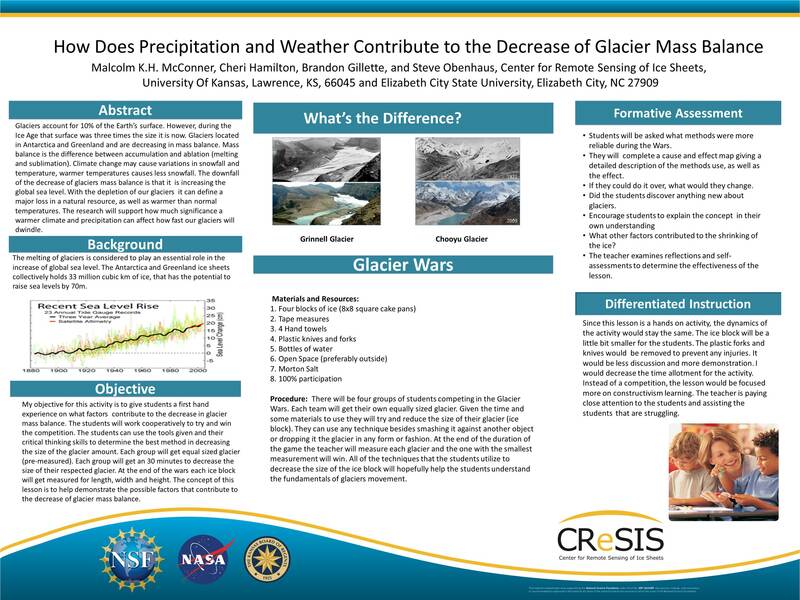 How does precipitation and temperature contribute into the decreasing of glacier mass balance? Glaciers account for 10% of the Earth’s surface. However, during the Ice Age that surface was three times the size it is now. The most prominent glaciers are located in Antarctica and Greenland and are decreasing in mass balance. Mass balance is the difference between accumulation and ablation (melting and sublimation). Climate change may cause variations in snowfall and temperature (warmer temperatures, less snowfall). Glaciers are more essential to human life, than people take for granted; they release fresh water scour bedrock and cool the weather during the summer. The downfall of the decrease of glacier mass balance is that it is increasing the global sea level rise. With the decline of our glaciers it can define a major loss in a natural resource, as well as higher sea level rise and warmer than normal temperatures. The research will support how much significance a warmer climate and precipitation can affect how fast our glaciers will dwindle. CReSIS is developing state-of-the-art ice penetrating radars to study ice sheets and how they are changing, but they need a way to move the radars across these very large areas of ice. The radars must travel very close to the surface, and always point straight down toward the center of the earth to maximize data accuracy. This research project provides a solution by implementing the engineering design process to design a sled on which multiple radar antennas can be mounted so that they may be towed across glaciers. Design parameters that must be included for the sled are: the cost and ease of constructing the sled, the freezing temperatures, the size of the sled, the comfort of the sled operators, the stability of the sled, vibration of antennas, the friction of the sled on the ice, the ability to traverse rough surface terrain and inclines, and the structural integrity of the sled with respect to the stresses and strains experienced during handling and operation. After the sled is created in a computer-aided design (CAD) model to meet all specifications, it will be analyzed for structural efficiency, verified for antenna performance, and given time fabricated based on the CAD specifications. Once available to CReSIS researchers and collaborators, this sled will be used in ground field expeditions, traversing long distances in subzero temperatures to help CReSIS research large, complicated glaciers and how they are changing. Frequency Modulated Continuous Wave (FMCW) radars are used for accurately measuring the distance to a target. They can be used, for instance, to measure ice surface topography, snow thickness over sea ice, and shallow sub-surface layers. Ultra-Wideband FMCW radars require low spectral or range sidelobes to achieve very high resolution. The radar transmit signal often experiences amplitude modulation effects due to imperfections in the components that are commonly used in FMCW systems. To compensate for these effects, the last amplification stage can be used to shape the transmit signal with an arbitrary envelope profile. In this project we will use the wideband power amplifier chip TGA2509-FL with automatic gain control. We will implement a test envelope shaping circuit using the Agilent 33500 arbitrary waveform generator (AWG) to produce the desired gain profile. The 33500 AWG will be controlled from a computer and a simple prototype circuit will be demonstrated.